Read Update 12 online here. 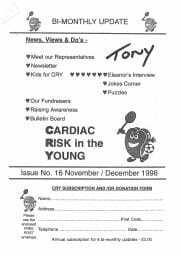 The CRY Update is the charity’s newsletter, reporting on CRY news and events, cardiac screenings, breaking developments in medical research and CRY supporters’ fundraising over the preceding months. Read Update 15 online here. The CRY Update is the charity’s newsletter, reporting on CRY news and events, cardiac screenings, breaking developments in medical research and CRY supporters’ fundraising over the preceding months. Read Update 16 online here. 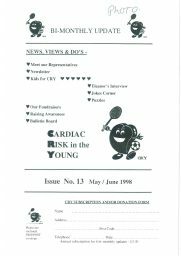 The CRY Update is the charity’s newsletter, reporting on CRY news and events, cardiac screenings, breaking developments in medical research and CRY supporters’ fundraising over the preceding months. Read Update 18 online here. 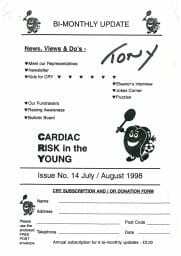 The CRY Update is the charity’s newsletter, reporting on CRY news and events, cardiac screenings, breaking developments in medical research and CRY supporters’ fundraising over the preceding months. Read Update 19 online here. The CRY Update is the charity’s newsletter, reporting on CRY news and events, cardiac screenings, breaking developments in medical research and CRY supporters’ fundraising over the preceding months. Read Update 20 online here. 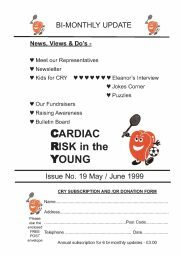 The CRY Update is the charity’s newsletter, reporting on CRY news and events, cardiac screenings, breaking developments in medical research and CRY supporters’ fundraising over the preceding months.